For most of our database set-ups we use a different TEMP space for application users than for end-user/support/developer/reporting usage. The intention is to minimise the potential impact of a rogue ad-hoc query on the main applicaiton. This is documented but I wasn’t previously aware. No surprise that this learning opportunity was presented as a direct result of a rogue query on a prod DB blowing out the main TEMP space. Deduction quickly suggested that the above must be the case and it was quickly proven by a test case and also supported by the documentation . Obviously… not using ALTER SESSION and using fully qualified object names prevents this “vulnerability”… but that’s not good enough unfortunately. Below is a SQL statement from a performance problem I was looking at the other day. This is a real-world bit of SQL which has slightly simplified and sanitised but, I hope, without losing the real-worldliness of it and the points driving this article. You don’t really need to be familiar with the data or table structures (I wasn’t) as this is a commentary on SQL structure and why sometimes a rewrite is the best option. There is no particular problem with how the SQL statement is written per se. It is written in what seems to be a standard developer way. Call it the “lay everything on the table” approach. Hmmm… Let’s look at why this can be a problem. First, what is the essential requirement of the SQL? The Optimizer tends to rewrite and transform any SQL we give it anyway and tries to flatten it out. The SQL above is already flat so isn’t that a good thing? Shouldn’t there be less work for the optimizer to do? No, not necessarily. Flat SQL immediately restricts our permutations. The problem comes with how Oracle can take this flat SQL and join the relevant row sources to efficiently get to the relevant data. Let’s assume that we should drive from today’s deal statuses (where we actually drive from will depend on what the optimizer estimates / costs). We want to join from today’s deals to yesterdays deals. 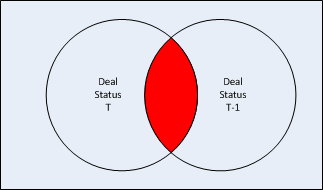 But the data for the two sets of deals data is established via the two table join (DEALS & PORTFOLIOS). We want to join on TRADE_ID which comes from the two DEALS tables and PORTFOLIO_ID which comes from the two PORTFOLIOS tables. So from our starting point of today’s business deals, we can either go to PD or to PDP, but not to both at the same time. Hang on? What do you mean not to both at the same time? For any multi-table join involving more than two tables, the Optimizer evaluates the different join tree permutations. Oracle has a tendency to choose what is called a left-deep tree. If you think about a join between two rowsources (left and right), a left-deep is one where the second child (the right input) is always a table. NESTED LOOPS are always left-deep. Zigzags are also possible, a mixture of left-deep and right-deep. Below is an image of a left-based tree based on the four table join above. A right-deep tree is one where the first child, the left input, is a table. The essence of the problem is that we cannot get what is called bushy join, not with the original flat SQL. The Optimizer cannot do this by default. And this isn’t an approach that we can get at by hinting (nor would we want to if we could, of course!). To get this bushy plan, we need to rewrite our SQL to be more explicit around the set-based approach required. How exactly does the rewrite help? By writing the SQL deliberately with this structure, by using WITH to create subqueries in conjunction with no_merge, we are deliberately forcing the bushy join. This is an example execution plan that this bushy tree might represent. Is this a recommendation to go use WITH everywhere? What about the no_merge hint? The no_merge hint is a tricky one. This is not necessarily a recommendation but its usage here prevents the Optimizer from flattening. I often find it goes hand-in-hand with this sort of deliberately structured SQL for that reason, and similar goes for push_pred. Do developers need to know about left deep, right deep and bushy? It helps to think in sets and about what sets of data you are joining and recognise when SQL should be deliberately structured. 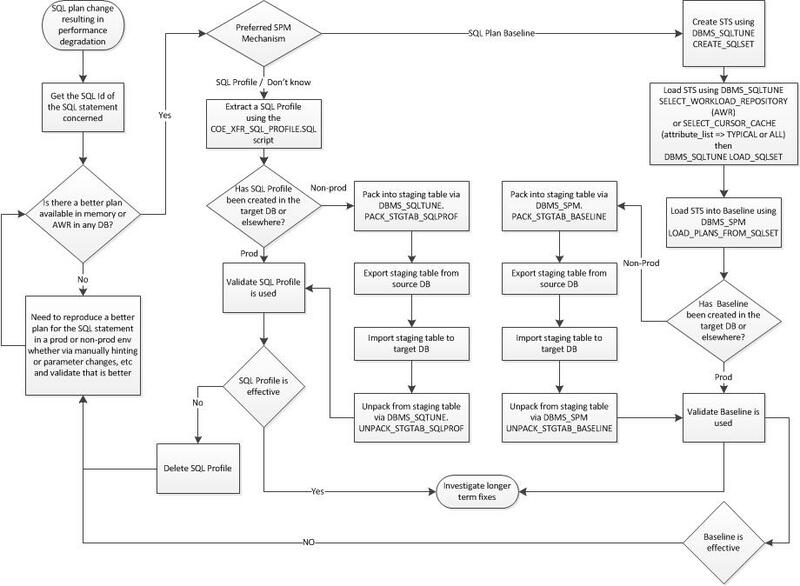 My thoughts on SQL plan management decision points: SQL Patches are also available, primarily to avoid a specific problem not to enforce a particular plan, and are not covered in the above flowchart. Moving through some observations of an ongoing investigation tackling the easiest ones first. Previously I observed the slow execution of a recursive delete of statistics history but coming not from MMON but from a number of application processes which should have only been calculating stats for their own partitions. From the real time sql monitoring output of a single execution (DBMS_SQLTUNE.REPORT_SQL_MONITOR EXEC_ID parameter) , I observed that EXECS was greater than 1 and so the A-Rows was much larger than I expected for a statement which was deliberately restricting the number of rows affected by a ROWNUM predicate. Initially I was stumped by the fact that A-Rows in steps 2-3 was greater than the ROWNUM predicate restriction (10000) but that was before I noticed the number of EXECS and EXECS * 10000 = 14M so was this a report of a bulk/batched statement? So, this is just an illustration that such a bulk bound statement will produce an output as per above. Hunt down my SQL execution and get RTSM output of statement. V$SQL reports this as one execution updating 1M rows. RTSM reports it as 1044 (!?) executions and doesn’t seem to deal with the number of rows updated. We only get the bind for the initial bind – not unexpected. By contrast a non-bulk bound FOR LOOP statement would register as 1000 executions in V$SQL and each a separate SQL_EXEC_ID. However this does nothing to address the concern about what the heck is going on such that application processes executing gather_table_stats for a particular partition would each end up running this bulk indiscriminate cleanup script… heading that way next.